Home News & Views Railway Budget 2016: What it means to railyatris! 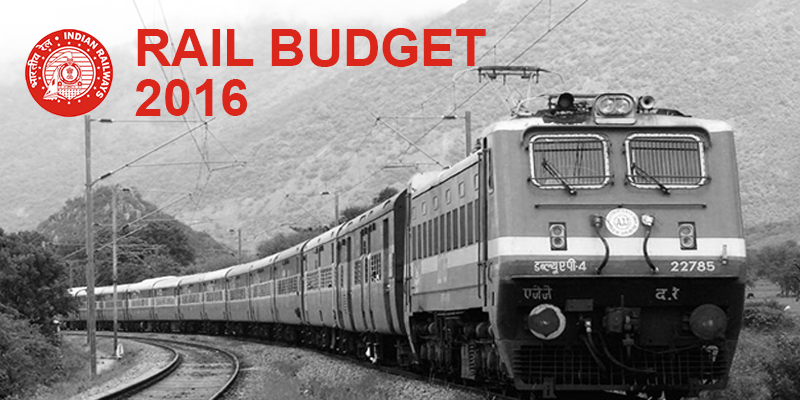 Railway Budget 2016: What it means to railyatris! No hike in railway fares. 33% sub-quota for women under all reserved categories. Increase the quota of lower berths for women and senior citizens. FM radio via PA system for passenger entertainment proposed. IRCTC will make available local cuisine of choice. Wi-Fi at 100 railway stations this year and 400 next year. Rail Bandhu magazine in all regional languages. Coolies will be called ‘Sahayaks’. GPS-based digital display boards will be installed in coaches for showing upcoming stations. Sarthi Seva (help to senior citizens) will expand this service. There is an increase in seat quota this year; 50% up for senior citizens. The cleaning of toilets by requests through SMS. 17,000 bio-toilets and additional toilets to be provided by end of this Fiscal Year. Multi-purpose stalls at station to provide multiple services like milk and medicines. e-catering to be extended to all rail stations. e-ticket facility for foreign debit and credit card holders to be included. Cancellation facility through 139 helpline number. Overnight double-decker trains to be introduced on business travel routes. Long distance superfast trains Antyodaya Express for unreserved passengers. Deen Dayal unreserved coaches for long distance train passengers. CCTV network has been provided at 311 railway stations. Enhanced capacity of e-ticketing system from 2000 tickets/min to 7,200/min. Introduction of 1,780 ticket-vending machines. North-East India, especially Mizoram and Manipur, to be connected through broad gauge soon. 2,800 km of new tracks to be commissioned next year. Bad budgets from railway nothing is special Indian railway ka paisa kha gaye ye log………..
Just idea.. I think you can use voice base speaker on every coaches so you can provide station and other information rather than useing GPS-based digital display boards and we can save the display bord system money and maintinance. For voice system i think we need only speakers on every coaches and one mike with driver..
Budget is upto satisfaction but for mobilizing funds for Train network to all India,Railway Minister ought to have added 8% railway development cess for three years on basic rail fare. In long distance trains having less general class bogies, bcz of this so many peoples entering SL and 3rd Ac .so many times this coach peoples not comfort. Sir request u to increase second class seating coach with current reserve system ..and also some more strict rules are required…. .current reserve make it in online also . Important improvement in this railway is that online confirmation on passanger present on coach.if that person not present till two or three upcoming station that reservation should cancelle.and automaticaly that seat available on current reservation. ….. This year railway budget is very welcoming and appreciating.Improving the facilities for common men have been taken into consideration while traveling in the train. I’m from Shahabad Ihad posted a request to honerable railway minister for storage LTT to Vishakhapatnam train to give stop at Shahabad.the request was not addressed in this budget.likewise many issues of other station may be pending before railway? need your action railway minister we are living in India not in other country.we are Indian citizen don’t ignore our right. Nice budget. Work should be done.